There is so much going on at PokerStars, it is hard to pack it all into one PokerStars review. I would suggest that you read my highlights below if you have never played online poker before, or – if you are an experienced player – click “PLAY NOW” to be redirected to the site to begin your PokerStars experience. If you use the shortcut, please note that the PokerStars bonus is attached to your first three deposits, so you don´t have to fill your account up in one go. April, 2019 – PokerStars is the world´s largest poker website – offering the widest range of real money poker games, the most valuable poker tournaments and an exciting rewards program in which players can exchange their loyalty points for entry into some of the world´s biggest live poker tournaments. Currently responsible for hosting more games of online poker than all the other poker websites combined, PokerStars is a natural first choice for many poker players, and my PokerStars review will tell you why. PokerStars offers all new players a 100% “match” bonus on the first three deposits made within a sixty day period of first funding your account (not necessarily within sixty days of registering an account). The maximum bonus which can be obtained depends on the currency with which you are funding your account; so you might see adverts for a £400.00 limit on your PokerStars bonus if you live in the UK or a €500.00 limit if you live in Germany. Most places outside of Europe will advertise the PokerStars bonus as $600.00, and you can choose whichever of the three currencies you wish to play in. The bonus is released into your account in increments of £10/€10/$10 as you collect PokerStars VIP Points until the full amount of the bonus is cleared; and you are allowed a maximum of 120 days from the date of your first qualifying deposit to clear the bonus (after which any outstanding bonus is forfeited). All the VIP Points you collect along the way can be used to exchange for tournament entries, cash rebates or goods from the PokerStars VIP store – so you are actually getting more than a 100% match on your first PokerStars deposit once all the bonuses are taken into account. There is no doubt that Texas Hold´em Poker is the most popular discipline of poker in the world, and PokerStars offers Texas Hold´em in a variety of formats – Limit, No Limit and Pot Limit. Cash games are available from the micro-stake limits of $0.01/$0.02 all the way up to $200.00/$400.00 and in the super-popular “Zoom” format, in which you can fast-fold your cards immediately and be whisked away to another table with a new set of cards dealt to you straight away. Other disciplines of online poker for real money are well represented on PokerStars, and if you wanted to polish your skills away from the Texas Hold´em tables, you can take advantage of a huge range of poker games on PokerStars which includes, Omaha, Omaha Hi/Lo, Seven Card Stud, Razz, Badugi, Triple Draw Lowball and Five Card Draw. PokerStars also offers a range of mixed poker games (HORSE, 8-Game and Triple Stud among them) if you would like to spice up your life with a little variety. PokerStars holds the record for the most valuable online poker tournament (in 2011 the final prize pool in the 10th Anniversary Sunday Million was $12,423,200) and the online poker tournament with the most players (in June 2013 225,000 players registered to play in a special World Record event). Every weekend the ten Sunday Majors have a combined guaranteed prize pool of $2.6 million, and every night of the week there are $10,000s more to be won in the site´s regular tournament schedule. The two biggest online poker series in the world are hosted on PokerStars – the Spring Championships of Online Poker and the World Championships of Online Poker (in 2010 the biggest single prize of $2,278,097 was won in the WCOOP Main Event) – and these are complimented throughout the year by other series, such as the MicroMillions and Turbo Championships of Online Poker for players with smaller bankrolls – although a comprehensive satellite schedule is provided for all PokerStars major tournaments. If you are unfamiliar with poker websites´ Rewards Programs, PokerStars has one of the easiest to explain – and benefit from. PokerStars awards you StarsCoin for contributing to the rake deducted from cash game pots or for paying a fee to enter a Sit n Go or multitable tournament. The more StarsCoin you are awarded, the higher level you achieve in PokerStars´ VIP Club. As you achieve higher levels in the PokerStars´ VIP Club, you are awarded future StarsCoin at a much faster rate. StarsCoin can be exchanged for cash and tournament entry tickets, or used to buy-into exclusive StarsCoin tournaments with cash prizes and satellites to PokerStars´ biggest weekly tournaments. StarsCoin can also be used to purchase goods and gift vouchers from the PokerStars store. In addition to the PokerStars bonus for new players and its lucrative rewards program, PokerStars is running online poker promotions all the time. Permanent promotions include a multitable tournament leaderboard, which awards prizes on a weekly, monthly and annual basis, and the popular PokerStars Women´s Club – which is available only to female poker players who can play in exclusive tournaments and freeroll events with added prize money and special bonuses. In the run-up to “Milestone Hands”, PokerStars give away $100,000s in prizes to players competing in a cash game ending in 000,000, they frequently offer “Golden Sit n Go” promotions in which prize pools are randomly increased up to ten times the value of your buy-ins, and in the past have awarded cash prizes to players who post their winning Zoom Poker hands on the Boom! poker hand replayer. As you might expect, the world´s biggest poker website draws the world´s best players; and although the world´s best players can afford to mix it up at the highest stake levels, they often drop down into the “recreational zone” to play on cash tables against the likes of you and I. This is not necessarily a bad thing, because it will help improve your game, but it can result in a steep learning curve! The top professionals also compete in many of the most valuable tournaments on PokerStars, and although this does not eliminate the possibility of scoring a big win, it does make it that little bit tougher when you are sitting at a table sandwiched between PokerStars Team pros Daniel Negreanu and Victoria Coren! It would be fair to say that if you can maintain a bankroll on PokerStars, then you are an above average player yourself. I mentioned at the start of my PokerStars review that PokerStars is responsible for hosting more games of online poker than all the other poker websites combined, and this has both good and bad consequences. The good is that you can find cash games open at any time of the day or night, and can play in Sit n Go and multitable poker tournaments practically on demand. However, the disadvantage of playing on such a popular site is that it is difficult to maintain notes on your opponents – an essential part of playing successful online poker. Furthermore, as it may be a long time until you encounter the same opponent again, the notes that you make on their playing style may be out of date by the time you are seated together again at the same table. I am going to move away from assessing the pros and cons of playing on PokerStars and dedicate the remainder of my PokerStars review to some of the more technical aspects of the PokerStars download, setting up an account with PokerStars and funding an account with PokerStars. PokerStars is compatible with Windows, Mac and Linux using Wine software (PokerStars gets a “platinum” rating on WineHQ for working on Linux operating systems). There is also a PokerStars download for iOS and an Android client for mobile devices. The PokerStars download is a straightforward process due to the Set-up Wizard that is included in the software bundle, and it should only take you a couple of minutes before the PokerStars download is completed – subject to the speed of your computer´s processor, your Internet connection and your computer´s compatibility with PokerStars system requirements. Before you can gain access to the thousands of opportunities available on PokerStars, you have to register an account. 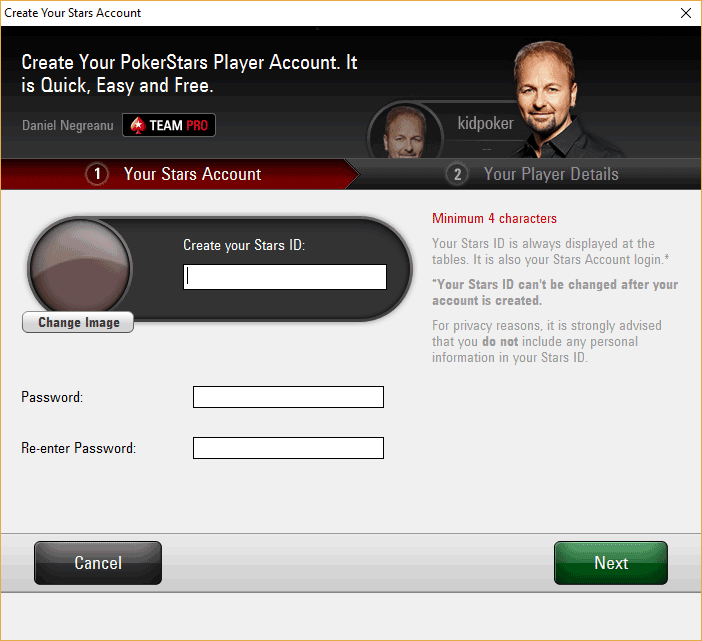 This is a simple procedure done through the PokerStars client (the software you have just downloaded) and to start the registration process you simply click on the red “Log In” button at the bottom right hand side of the client and then select “Create New Account”. A new window will open which asks you to choose a User ID and Password, tell PokerStars your email address and where you heard about them. 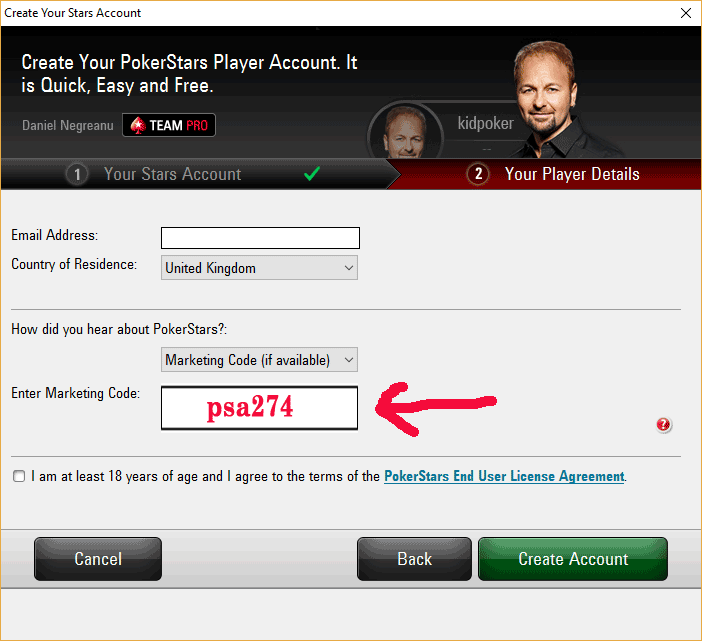 We would respectfully request that you complete the PokerStars marketing code “psa274” in the drop down box where indicated. It won´t affect your bonus if you forget, it just lets PokerStars know that we are working hard to bring new customers to their site, and they reward us from time to time with exclusive special offers for our readers. 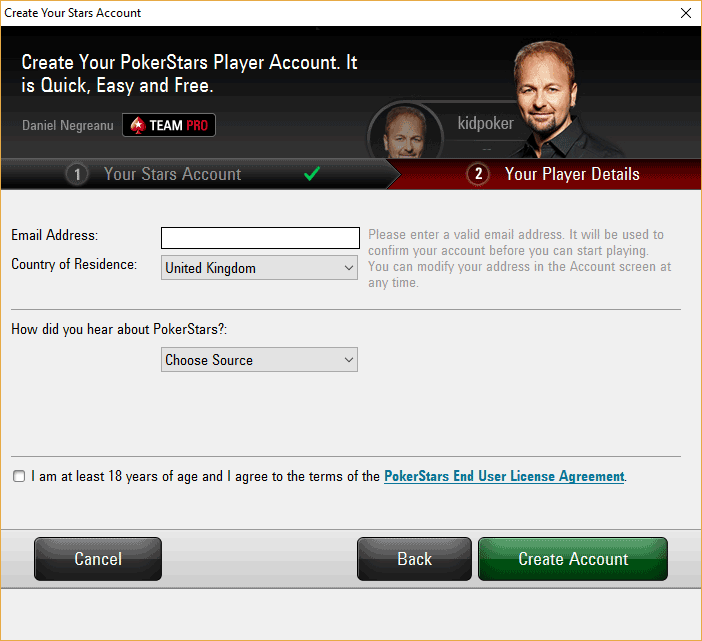 Once you have completed the first page of the registration PokerStars will send you a welcome email in which they will ask you to validate your email account (this is different from validating your ID which comes later). 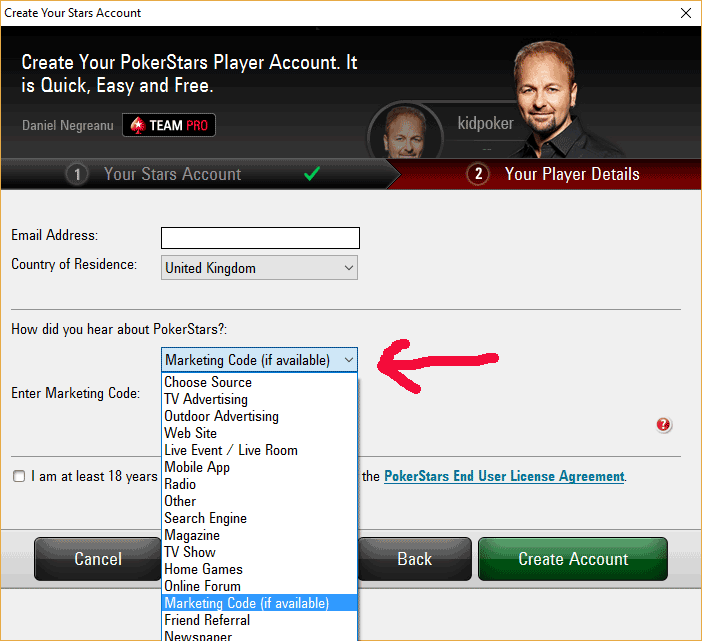 There is a code in the email which you should copy and paste into the “Validate Email Address” drop down box from the “Account” section of the PokerStars client. Now you are able to make your first PokerStars deposit. PokerStars want their poker website to be fair and free of any cheating or collusion, and they are subsequently very tight when it comes to security and ID verification. The penalty for breaking the terms of service is usually the closure of your account, and if you are banned from PokerStars online, you cannot compete in any of their live events either. PokerStars is also very aware of the potential for poker accounts to get hacked, and only last year the site introduced a policy which automatically suspends a player from playing on the site if suspicious activity is identified on their account. To protect your bankroll it is a good idea to sign up for SMS verification so that PokerStars can quickly send you a security code to re-activate your account if it is suspended by mistake. You do not have to be stuck indoors playing PokerStars on your desktop computer any more as PokerStars have developed mobile apps for iOS and Android operating systems which allow you to play your favourite games from anywhere at any time. Cash games, Sit n Gos and multitable tournaments are all available through PokerStars´ mobile app and you can access the Cashiers page as well if you need to top up your account. I personally use the Android compatible PokerStars mobile app and found it to be an excellent alternative to the desktop client. Having used other mobile apps to play poker for real money, I personally think that the PokerStars mobile app is the best currently available – although I have never found out how to log out of my account when I have finished playing, and usually just reboot my phone. I have pretty much been singing PokerStars´ praises throughout my PokerStars Review, but there is one area in which I believe they could do better, and that is in the area of Customer Service. I understand that to provide a Live Chat facility for 100,000´s of clients would be a logistical nightmare, but would it be so difficult to put somebody on the end of a phone you can talk to? The frequently asked questions on the PokerStars website are, by nature, frequently asked; and if there is a common problem, it is easy to find a solution. But there are times when something happens which is not covered in the FAQs (like how to log out of the PokerStars mobile app) and it would be reassuring if there was somebody available to talk to, rather than having to wait for a reply by email. What Else do PokerStars do? PokerStars sponsors many of the world´s leading live poker tournaments and offers players the chance to qualify online for events such as the European Poker Tour and Aussie Millions. Practically every country in which PokerStars has a presence has its own national PokerStars-sponsored poker tour (UKIPT in the UK, ESPT in Spain, FPS in France etc) and they recently broke their own record for the highest number of players to enter a live poker tournament outside of the US when 2,400 players competed in the Brazilian Series of Poker “Millions” Grand Final. The highlight of PokerStars´ live poker sponsorship is the annual PokerStars Caribbean Adventure – the largest live poker tournament series after the World Series of Poker. More commonly known as the “PCA”, the series pays out more than $25 million in prize money over more than sixty events. It gives recreational players the opportunity to mix with the stars of the poker world in a luxury setting and come away with some valuable prizes – as amateur player John Dibella did in 2012, when he turned a $1,000 satellite entry into a $1,775,000 payday! I hope to meet you on the PokerStars tables very soon!